John Dougall asked me recently if I thought Calculus was really necessary for a CS degree. I do and here's why. Calculus teaches and encourages abstract thinking, something that is necessary to be a good programmer. Those who are discouraged by Calculus may find that they can get along just fine in college programming exercises, but they won't do well in the modeling that is necessary for real-life software architecture—not because they're missing Calculus, but because they struggle with abstract thinking. Engineers typically use calculus to optimize some part of a bridge, circuit, or something else. They do this by creating a model of the thing they're building. Computer scientists rarely optimize models in this way. Rather they create their own abstractions that model some real-world system. Thinking abstractly is vital to good system design. Seeing how others use mathematics to abstractly model things (i.e. 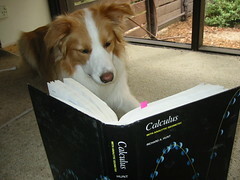 learning calculus) is good preparation for that challenge. In general, one of the chief reasons for going to college to study CS isn't to learn to program. You can learn that at Code Academy or whatever. You go to college to change the way you think and that's going to happen both inside and outside the courses in your major.